In this week’s episode, Cheryl and Joe discuss the psychological thriller The Gift and devote serious intellectual energy to where this move flies off the rails and what exactly the main characters’ names are. This was Joe’s pick. 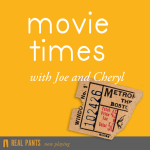 As always, send movie suggestions, comments, inquiries, and critiques to movietimeswithjoeandcheryl@gmail.com.